The consequences of these situations are unimaginable,terrible. So parents need to stop these things happening and this is our baby proofing safety kit works for. So buy it now!! ❤️【PACKAGE INCLUDE】Our child safety kit contains 2 Stove Knob Protectors, 2 Door Stoppers, 2 Door Finger Pinch Guard, 16 Electric Outlet Covers, 8+4 Corner Protectors,8 Cabinet Locks,2 Door Knob Wall Shield. 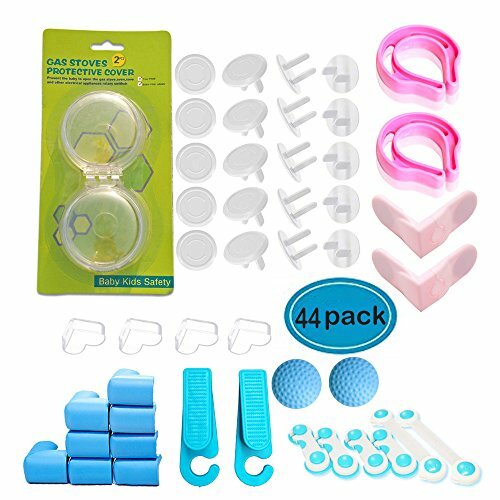 ❤️【KEEP YOUR BABY SAFE】Featuring stove knob protectors, door stoppers,door finger pinch guard, electric outlet covers(with 1 key),corner protectors, cabinet locks,door knob wall shield, this child proofing set will allow you to secure cabinets, drawers, kitchen appliances, toilet seats, furniture, plugs and more! ❤️ 【HIGH-QUALITY MATERIAL】Brand-new high-quality raw materials, durable plastics, eco-friendly. Mothers can trust it! ❤️ 【PERFECT GIFT】Nothing is more important than keeping a baby safe and protected.This product would be a perfect baby shower gift for your baby or a mom who has a baby. ❤️ 【NOTE】This product contains tiny parts,please let your baby stay away from it while they are spared in case that baby accidently eat it. If you have any questions about this product by Little Joy, contact us by completing and submitting the form below. If you are looking for a specif part number, please include it with your message.